More homes and businesses than ever are turning to solar energy to reduce electricity costs and live more sustainably, and the industry that brings food from the farm to your table is no exception. The agriculture industry relies on electricity for crucial tasks such as pumping water to quench drought-ridden crops to powering cold food storage. With ag electricity costs more than doubling from 2007 to 2012, according to the 2012 Census of Agriculture, the industry has turned to renewable energy sources. For example, the number of farm operations producing on-farm renewable energy doubled between 2008 and 2011, according to a U.S. Department of Agriculture report. Here are the stories of three companies that switched to SunPower® solar energy to bring cherries, mushrooms and wine to consumers in a more cost efficient, environmentally sustainable way. Rivermaid Trading Co., a fruit grower, processor and shipper that has long practiced sustainable farming methods, produces more than 50 percent of the pears in California and 8 percent of the state’s cherry crop. Getting such large quantities of fruit to market in peak condition requires substantial energy to run processing machines and cold storage. Going solar was the natural next step to help the company offset electricity costs. “Energy consumption at our fruit-packing facility is driven largely by cold storage. We are able to offset almost 60 percent of our electricity use in the summer by installing solar,” says Rivermaid CEO Patrick Archibeque. Rivermaid’s cherry packing facility in Lodi, California, requires a significant amount of cold storage. Sunworks, a leading northern California/eastern Nevada solar contractor, helped Rivermaid turned the roof of its fruit-processing and cold storage facilities into a solar energy plant, installing 4,510 highly efficient SunPower panels with a capacity of 1.47 megawatts of clean energy. “We recommended SunPower for Rivermaid because of the amount of solar we could fit on their roof. We were able to increase their energy production with the same amount of solar by 20 percent (compared to conventional panels),” explains Kelly Christopher, commercial solar specialist for Sunworks. The system is expected to save Rivermaid more than $13 million over the next 25 years. 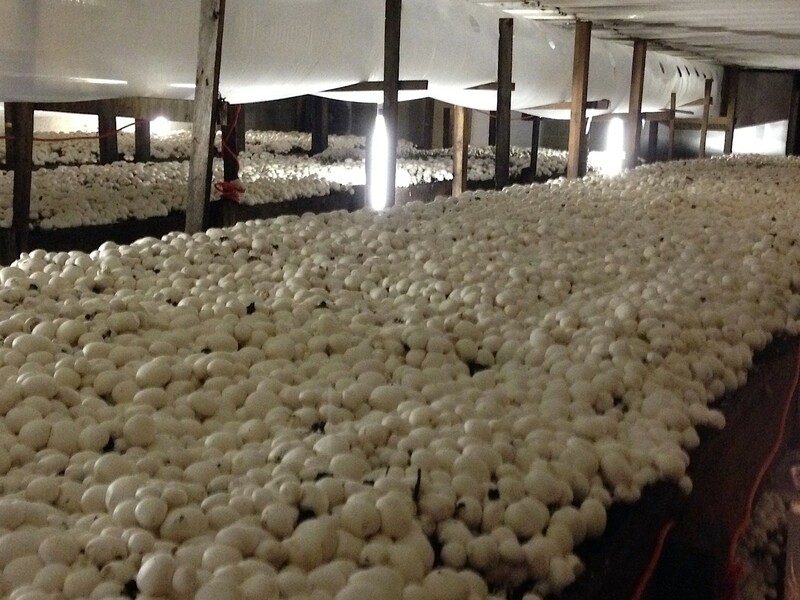 Marlboro Mushrooms is a fifth-generation family farm committed to renewable energy. Founded in 1910, Marlboro Mushrooms in West Grove, Pennsylvania, is the oldest continuously operating mushroom farm in the United States, producing more than 4 million pounds of mushrooms annually. Did you know that mushrooms are one of the most energy hungry crops to produce? They must be grown indoors in a carefully controlled 60 degree high-humidity environment where they double in size every 24 hours. Most of the energy is used for air conditioning and heating, and refrigeration is required for dehumidification even in the winter. “Mushrooms require a constant back and forth between heating and cooling,” explains Tom Brosius, co-owner, in a SunPower case study. With 100,000 square feet of growing rooms, Marlboro Mushrooms partnered with SunPower to offset that energy consumption. SunPower engineered, designed and built a 1.13 megawatt ground-mount solar installation with sun-tracking capability. The company reports that the system has delivered on their expectations of reliability, quality and value, performing at or above projections since it was commissioned in November 2011. The solar installation produces more than 1,700 megawatts of clean energy for mushroom farming operations each year. As a result, the mushroom producer has dramatically reduced its energy costs, even occasionally generating more electricity than it uses. Making a world-class cabernet takes more than just California sunshine and grapes. It also takes quite a bit of energy, particularly in the barrelhouse, where grapes are slowly and expertly transformed into wine. Most electricity usage in the wine industry goes toward refrigeration for fermentation cooling, cold stabilization and cold storage. Other uses of energy include pumping, compressed air, bottling and lighting. Rodney Strong Vineyards is one of the largest franchises in Sonoma County, California. It has earned a reputation as an environmental steward, relying exclusively on Sonoma County grapes and investing in more than 1,000 acres of vineyard land. In 2003 Rodney Strong decided to take its environmental commitment to the next level by going solar. 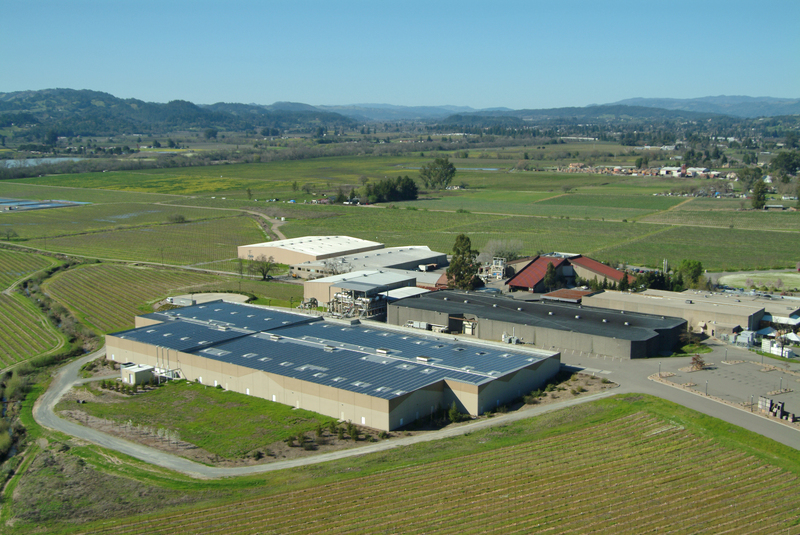 SunPower designed and installed a solar power system on the rooftop of the winery’s 100,000 square foot barrelhouse. Covering 80,000 square feet, the 766 kilowatt, 4,032-panel SunPower system is one of the wine industry’s largest. It generates the daytime energy equivalent to powering nearly 800 homes, reducing the winery’s energy usage by 35 percent and cutting its electricity costs by more than 40 percent. Over the next 25 years, Rodney Strong’s solar generated electricity is expected to avoid 8,700 tons of carbon emissions. That’s the equivalent of planting 2,500 acres of trees. Learn more in the case study here.